In the spirit of this season of giving thanks, we are grateful CAMP Rehoboth Outreach Program (CROP) teams were able to benefit many organizations and individuals this year. And we received many expressions of thanks in return. So many volunteers made another banner year possible as CROP makes a difference in Rehoboth and beyond. In February, festively-dressed CROP teams came together to usher at the three CAMP Rehoboth Chorus concerts. The teams shattered previous records collecting donations for the chorus's Music & Memory program, which is near and dear to their hearts. Later that month, 30 people attended the CROP open house to hear about CROP’s history and evolution, 2017 highlights, and upcoming projects. CROP Founder Claire Ippolitti shared her vision for the fledgling Volunteer on Vacation program that later became CROP. In March, CROP prepared and served a meal at the Immanuel Shelter, garnering rave reviews from the diners. April’s CROP project, in conjunction with Women’s FEST, saw volunteers head to Milton and Ellendale to put the final touches on landscapes at two recently-completed Habitat for Humanity properties. And two days later, CROP turned out to help at the uplifting Broadwalk on the Boardwalk to fight cancer. In June, for the 8th consecutive year, CROP participated with other volunteers in National Trails Day at Cape Henlopen State Park. Many children took part and learned the importance of good stewardship regarding the environment and the park we love so much. One week later, CROP turned out at VegFest to support healthy, sustainable, and compassionate living. The new Delaware Botanic Gardens (DBG) in Dagsboro saw CROP volunteers assist with its mission of developing a world-class, inspirational, educational, and sustainable cultural destination—a public botanic garden in southern Delaware. Ten days later, it was off to Milford and the Food Bank of Delaware to shuck a lot of corn and help the Food Bank in its mission of providing nutritious foods to Delawareans in need. The International Student Outreach Program helps to provide international students working in our area with a safe environment by offering free meals. 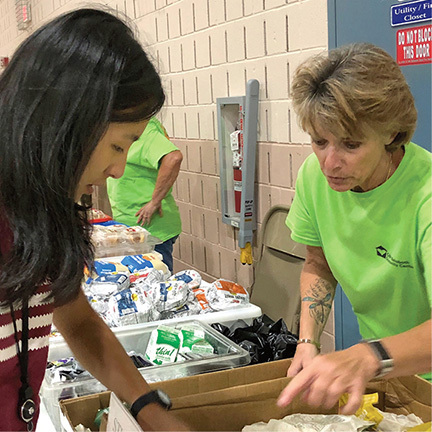 In August, a CROP team joined Epworth United Methodist Church volunteers in serving their weekly dinner and distributing reclaimed food. A highlight was the chance to interact with students from many countries. In October it was back to the Botanic Gardens. Weather prevented us from doing much gardening, but we learned about their progress and had a personal tour of the meadow and woodland. In November it was time for the movies and cultural enrichment! CROP helped at the Rehoboth Beach Film Festival by supporting the film showings at the Cape Henlopen High School venue. Later, just in time for Thanksgiving, a CROP team returned to the Food Bank of Delaware to help assure no one in the state one goes hungry this holiday season. Debbie Woods is an active volunteer with CAMP Rehoboth and also serves on the Membership Committee. She has lived full time in Rehoboth since 2009, when she retired after a long career in the Federal Government.